This memory got me thinking: what wine would rock dudes drink? I know, I know- I’m sure their fair share of Jägermeister, whiskey, beer and whatever else they have on hand flow like water, but what about the vino? The easy answer would be champagne: celebratory, popping corks, liquid fizzing and oozing all over them and their groupies. A barbaric, animalistic kind of simile if ever there was one. I think I’ve found that wine, nay, bubbly. But, at this price point, you can afford to spray it all over you and whoever else flashed the security guard. This week’s white is not actually white, but a pale, orangish pink. It is in it’s own category, actually, but since it does contain 80% Chardonnay, this is what I offer up to you. (Cleveland: are you ready to rock?!?!?) 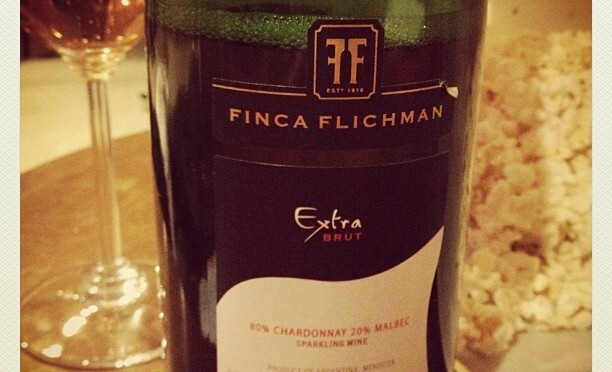 Straight outta City Pages Best of 2012 Liquor store, Zipps, I bring you Finca Flichman Extra Brut! This wine is all suds and fun. Persistent bubbles overfloweth like sweet sounds from a Marshall stack, while the orangey pinkish hue jazzes it up like a good pair of leather pants. Yeah, it’s cool, and cool people drink pink wine. With a $10 price point, bring it to a birthday party, toast to someone’s good fortune, get naked and shake it all about – or all the above. However you unleash your inner rock star, grab this sparkling wine and turn it up to 11.